The NASSCOM report “Perspective 2020” identifies the industry’s long term certainties and opportunities arising from current economic environment. It also outlines specific measures that the industry, NASSCOM and the Government will need to undertake over the next 12 years for the industry to realize these opportunities. “The Indian IT industry has grown from USD 2 billion in export revenues in 1998 to USD 47 billion today, employing over two million people. Its impact on the Indian economy and stakeholders, including customers and employees, remains unparalleled. Today, the industry recognizes that the next decade will be fundamentally different from the last one, owing to a radically restructured global economy; rapidly evolving customer needs, services and business models; and rising stakeholder aspirations. 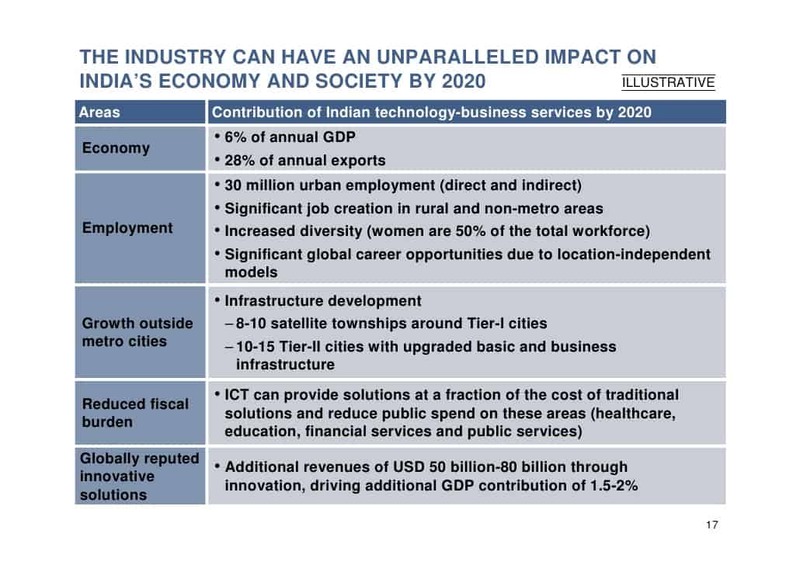 The NASSCOM ‘Perspective 2020’ defines the opportunities and the challenges for the industry to drive sustained growth in the domestic and global markets,” said Pramod Bhasin, Ex-Chairman, NASSCOM. New verticals: public sector, healthcare, media and utilities (which have adopted global sourcing only to a limited extent). New customer segments: small and medium businesses (SMBs). New geographies: greater outsourcing in BRIC, GCC, Japan and Rest of the World (ROW). Healthcare: 50% of Indians do not have access to primary healthcare. Technology can deliver healthcare at half the cost. Financial Services: 80% of Indian households do not have bank accounts. Technology can enable access to 200 million families. Education: India faces a 3-fold shortage in teachers. Technology can address this through remote solutions. Public Services: 40-50% of public food distribution in India doesn’t reach targeted groups. Technology can ensure transparency. These new opportunities will result in export revenues of USD 175 billion by 2020. 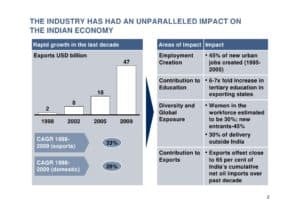 On the back of these megatrends, the Indian domestic industry too will experience significant growth and record a four-fold increase in revenues from USD 12 billion in 2008 to USD 50 billion by 2020. The evolved landscape of 2020 will present transformational opportunities for the Indian technology and business services industry. India will emerge as a top three global innovation hub with a focus on clinical research, mobile applications and energy efficiency/climate change solutions. Through innovative business models, this sector will also redefine its customer value proposition and capture growth from currently untapped markets. In addition, harnessing ICT based solutions will help drive inclusive growth by uplifting 30 million citizens each year. The four major challenges which exist today include employability, infrastructure, favourable policies and competition from other low cost countries. Low employability of existing talent with only 10-15% employable graduates in business services and 26% of employable engineers in technology services continues to be a major bottleneck. Infrastructure development is largely constrained to the nine cities, which contribute more than 95% of India’s exports and development of tier 2/3 cities has not taken off in a planned manner. The lack of a supportive fiscal environment with a long-term policy framework is also leading to competition from other low-cost countries including China, Philippines and from Eastern Europe with potential erosion of the India opportunity. In the next 12 years, industry stakeholders need to act together in an unprecedented manner. ‘Perspective 2020’ details an action agenda for the industry, government and NASSCOM to realize the industry’s potential. In conclusion, India’s technology and business services industry has flourished in the last decade. However, industry stakeholders will need to break out of the traditional mold that resulted in past successes and step up to the aspirations of 2020.